Mochon-Collura estimated the mass contains up to 10,000 eggs. Wolf-eels are not a wolf, not a true eel and they’re not really dangerous unless provoked. In spite of their ferocious appearance, wolf-eels are very shy and docile. At the Oregon Coast Aquarium you can often see their heads poking out of a hole in the reef of the Aquarium displays. Wolf-eels are very involved parents. The male and female take turns coiling and oxygenating the eggs, while the other guards. She stuffed the squid mantle with other food, since squid isn’t highly nutritious. She lured them out of the den with squid, but ran out of food before removing the egg mass. Ultimately, she reached into the den, put her hands behind the male’s pectoral fins and gently pulled him out. She did the same thing to the female who immediately wrapped her tail around the egg mass. By all appearances the eels were back to normal after a short time. Mochon-Collura said the female looked for the eggs briefly, but quickly returned to normal behavior with her mate. Wolf-eels tend to pair with one mate. “But sometimes, there’s a soap opera and two females will compete for one male,” according to Mochon-Collura. 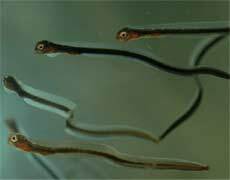 The hatchlings resembled tiny tadpoles at first but are now looking more and more like small wolf-eels, measuring about one to two inches in length. They will reach 12 – 18 inches in length by the first year; will begin pairing at about four years old and laying eggs by age seven. Wolf-eels live about 20 years and reach lengths of six to eight feet long at maturity. Some of the baby wolf-eels will eventually be shipped to other Aquariums, some will stay here at the Oregon Coast Aquarium and the Aquarium will look into releasing some into the appropriate habitat off the coast of Oregon.